“Captain Mike” Wright and First Mate Jody share decades of boating on ponds, lakes, bays and oceans. 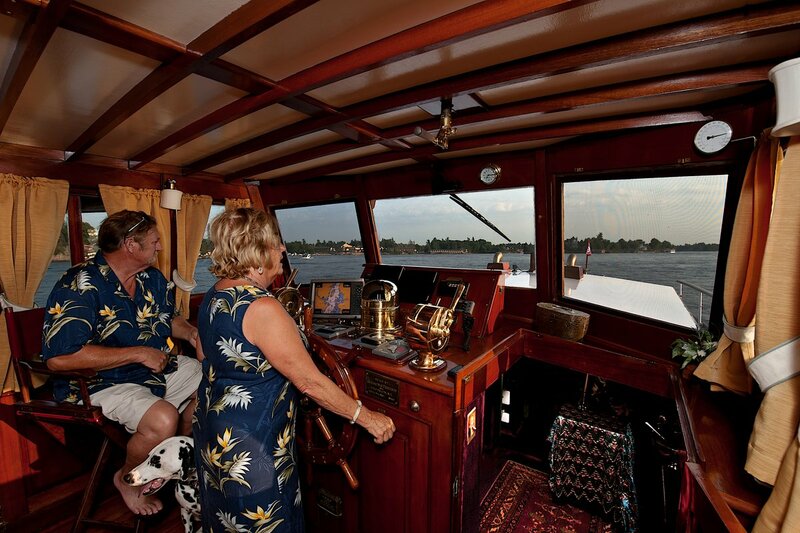 Their passion is boats and sharing the mystique of classic yachting with people who enjoy these relics of a bygone era. They also share a deep love for the waterways and life along what they call the Parallel Universe. Mike holds a master’s 100-ton license and has captained, consulted and surveyed some of the most prestigious wooden yachts on the east coast. He knows wood. Mike is a captain’s captain. Jody has lived with and on boats since she was a child, and has years of experience sailing offshore and managing projects, travel events and catering. She is expert at logistics, provisioning and hospitality. Jody has served as a consultant to multinational corporations, organizing special projects and challenging events throughout the US. She has written and published many articles documenting sailing adventures, their cruising and the classic yacht cruising lifestyle. 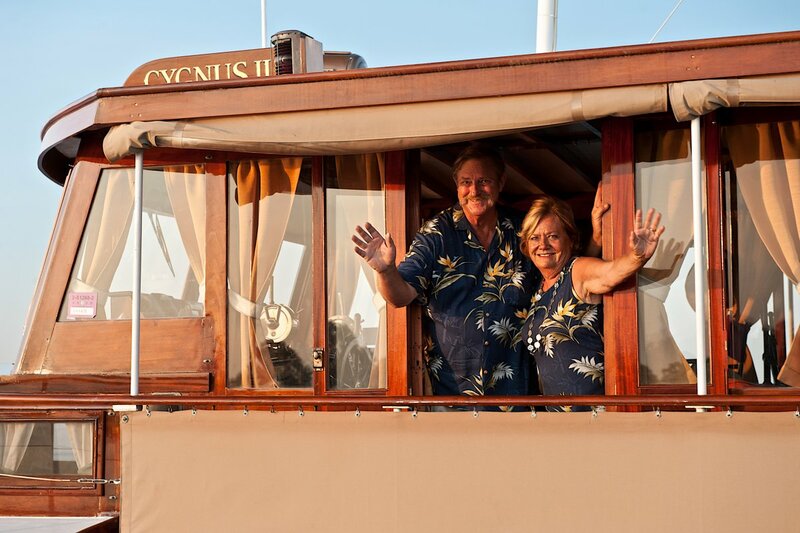 Cygnus II’s owners met on a classic yacht delivery several years ago and decided to share their passion and invest in a wonderful yacht, Hermione, which was recently lost in a fire. (See In Memory of Hermione). Since then they have logged many thousands of miles on the waterways which Jody terms the “parallel universe” sharing their yachts and their knowledge with literally thousands of yachting enthusiasts. The crew of Cygnus II isn’t complete without the two boat dogs, Labrador, Shelby and Dalmatian, Dublin. Both dogs have been written about in yachting publications and have experienced thousands of miles of cruising adventures, which they are glad to share with canine guests. When you board Cygnus II, you are considered honored guests, not head count. Both your hosts aboard Cygnus II are excellent cooks and experienced at all facets of yachting hospitality. We will gladly prepare simple meals and hors d’ouvres. We will do our best to make every cruise special, providing complimentary beer, wine … champagne or an appropriate cocktail punch. We also provide iced tea served properly with (or without) mint and lemon. Jody loves to create wonderful appetizers and snacks, and Mike is a wizard with shellfish. No guest goes hungry, or wants for any attention, with her aboard! However, the galley capability of Cygnus II is, so we encourage guests to enjoy major meals at many excellent destination restaurants. Or, where possible, we can have meals delivered from fine area restaurants for enjoyment aboard. “Cygnus II is a perfect example of what classic yachting is all about. From her beautiful lines to her detailing and original brass controls, she is a fine classic yacht. With Mike Wright and Jody Reynolds as owners and crew, she will make a wonderful charter vessel.” – Dan Ramia, Commodore, Classic Yacht Club of America. “This is the most beautiful boat I’ve ever seen.” – Anonymous. Words spoken by about 50 people on various docks. “Cygnus II is a real asset to our marina. She is a magnet for visitors. ” – Mike Bradley, dockmaster, Downtown Marina of Beaufort, SC. Cygnus II is a U.S. Coast Guard documented vessel.